Norwegian development policies need to be more coherent, with the Prime Minister's Office assuming greater coordinating responsibilities, recommends a new report by FNI researchers Irja Vormedal and Leiv Lunde. 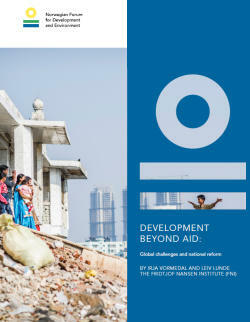 The report, entitled Development Beyond Aid: Global Challenges and National Reform has been commissioned by The Norwegian Forum for Development and Environment (ForUM) and was released today. According to the report, a just and sustainable development can only occur if policies pull in the same direction, without undermining each other. While the Norwegian Government is acknowledged for having recognized this in principle, the report finds many examples of incoherence. For instance, Norway takes a lead on peace issues, but continues to export military equipment to repressive regimes. Norway seeks to advance the environmental agenda,but remains a major producer of fossil fuels. Norway has a strong position on human rights, but is often weak on human rights in its investment practice. To make progress, the report suggests institutional reforms. These include placing the ultimate, legal responsibility for development policy coherence within the Prime Minister’s Office, and the administrative responsibility with the Foreign Minister.